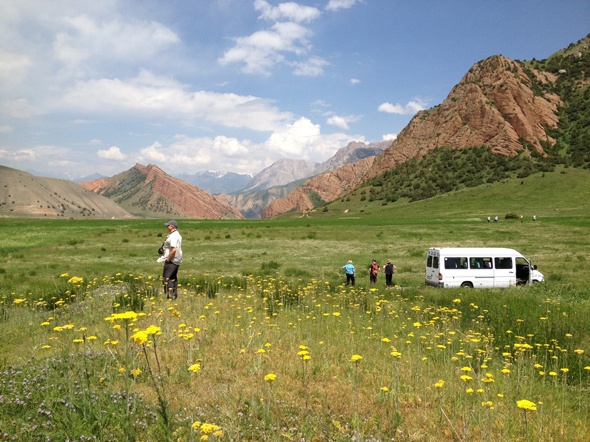 Well almost… somewhere along the M41, or Pamir Highway, in Kyrgyzstan’s Osh province there is a wonderfully scenic spot to have a picnic. I confess I’m not 100% sure of the exact place we pulled off the Pamir Highway, but we’d passed a sign saying “17 miles to Budalyk” and it was not long after a short walk alongside the waters of the Gulcha River. Next time perhaps I’ll take a GPS position, or maybe it’s better not to share exactly where it was!? 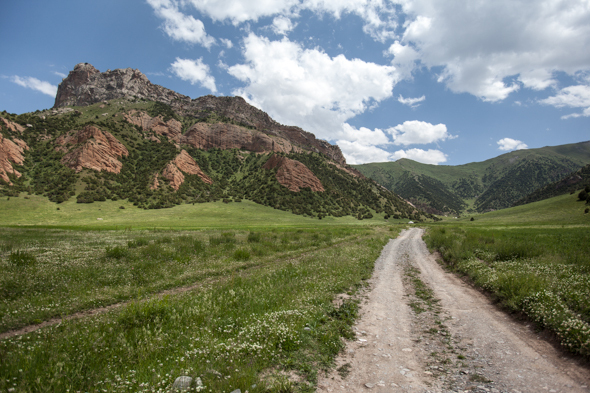 The spot for our picnic was up a track leading off the main road which lead towards a Kyrgyz yurt camp at the foot of several converging hillsides. 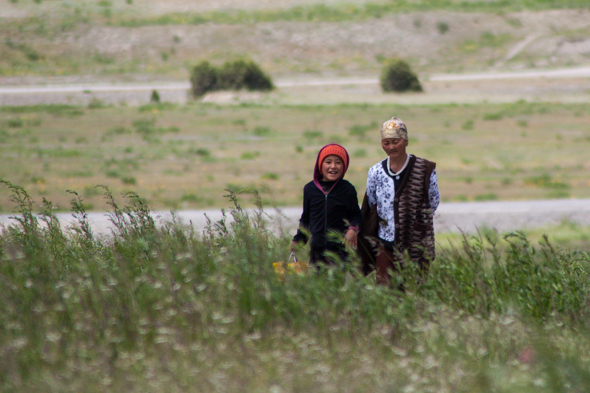 These small groups of yurts are dotted all over this part of Kyrgyzstan. You can just about make out the yurts in the following photographs. Whilst we sat on the grass eating our packed lunch a mother (I assume) and her daughter came walking up from the road. They were returning to the yurt camp by the looks of it and I managed to capture a wonderful moment when the young girl spotted us as we came into view. I love the look of excitement and perhaps surprise on her face! 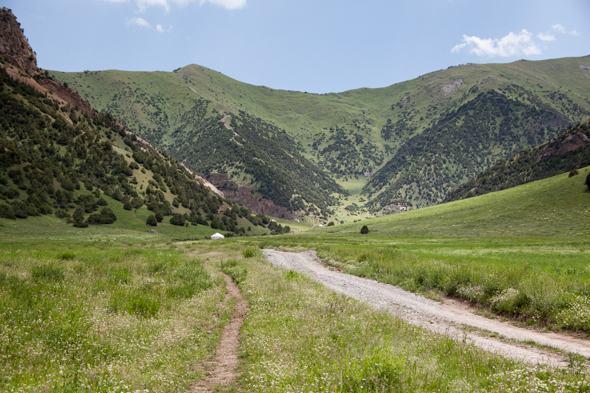 I’ve long regarded Kyrgyzstan as one of the most beautiful countries I’ve been too – check out my post “Kyrgyzstan, so beautiful it yurts!” (Sorry, that was an aweful pun…) if you don’t believe me… I’ve been there twice now and would highly recommend that part of the world. 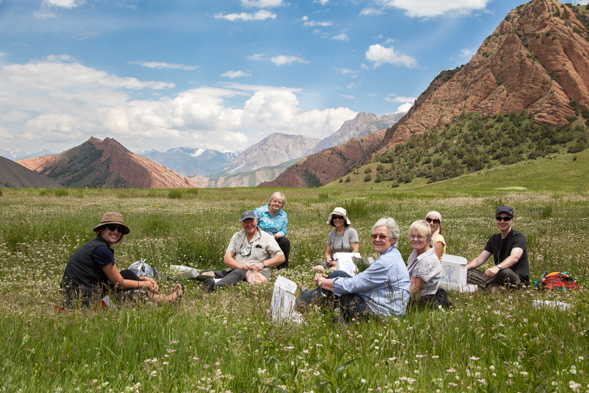 Kyrgyzstan is a mix of rugged, desolate landscapes, as we as vast plains and grasslands, together with stunning high altitude salt or glacial lakes. Not to mention the beautiful mountain plateaus high in the stunning mountains. Just when you think you’ve seen all, it has to offer you stumble upon yet another beautiful spot.